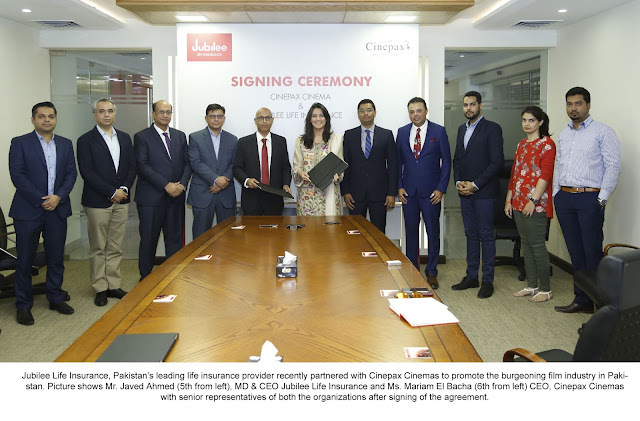 Karachi: Jubilee Life Insurance, Pakistan’s leading life insurance provider, has partnered with Cinepax Cinemas to promote the burgeoning film industry in Pakistan. Through this year-long agreement, signed by both organizations in July, Jubilee Life Insurance has cemented its role as a patron and supporter of Pakistani sports, arts and culture. Photo Caption: Jubilee Life Insurance, Pakistan’s leading life insurance provider recently partnered with Cinepax Cinemas to promote the burgeoning film industry in Pakistan. Picture shows Mr. Javed Ahmed (5th from left), MD & CEO Jubilee Life Insurance and Ms. Mariam El Bacha (6th from left) CEO, Cinepax Cinemas with senior representatives of both the organizations after signing of the agreement. Jubilee Life Insurance has collaborated with Cinepax Cinemas, which is currently operating 13 cinemas with 30 screens in 9 cities across Pakistan including Karachi, Lahore, Rawalpindi, Faisalabad, Gujranwala, Gujrat, Hyderabad and Islamabad having a total of 6,000 plus seats nationwide. Cinepax Cinemas will provide Jubilee Life Insurance with opportunities for on screen advertising, premises branding, on ground activation and various offers for Saffron members such as buy one-get one free silver screen tickets with popcorn and drink. Saffron is a loyalty club for its high net worth customers, who have put their faith in Jubilee Life Insurance and are gratified to be associated with the company for a secured financial future. Jubilee Insurance is a global brand of Aga Khan Fund for Economic Development (AKFED) that offers diverse insurance solutions (life, health and general) in the Asian and East African markets. Jubilee Life in Pakistan offers uniquely designed range of life and health insurance plans, catering to various customer segments and needs. These include retirement, child education, marriage, saving & protection, wealth accumulation, life insurance plans for women, rural insurance plans and life and health insurance solutions for the less privileged of our country. The company is also amongst the leading Window Takaful Operator’s in Pakistan. Cinepax Cinemas is Pakistan's largest cinema network committed to provide unmatched quality entertainment. Cinepax Cinemas believes that be it comfort, indulgence or state of the art visual/sound is key to enhancing a customer's experience. They bring the future of cinema entertainment to your doorstep offering unsurpassed levels of service, online ticketing purchase at the comfort of your home mixed with the best digital experience.